How a tragic accident led to breakthroughs in prosthetic science. “Anything you can think of, you can create,” says Van Phillips, inventor of Flex-Foot, a line of artificial legs that has revolutionized the field of prosthetics. When he lost his own left leg below the knee in a college water-skiing accident, he was determined to make a prosthesis that would allow him to run again. It took him years of effort to turn his idea into reality. Today, amputee athletes around the world are setting near-Olympic records with Flex-Foot legs designed for sprinting and other sports. His prosthesis for walking is a superbly functional device that has vastly improved the quality of life for thousands of people who have lost limbs from accidents, birth defects, or disease. 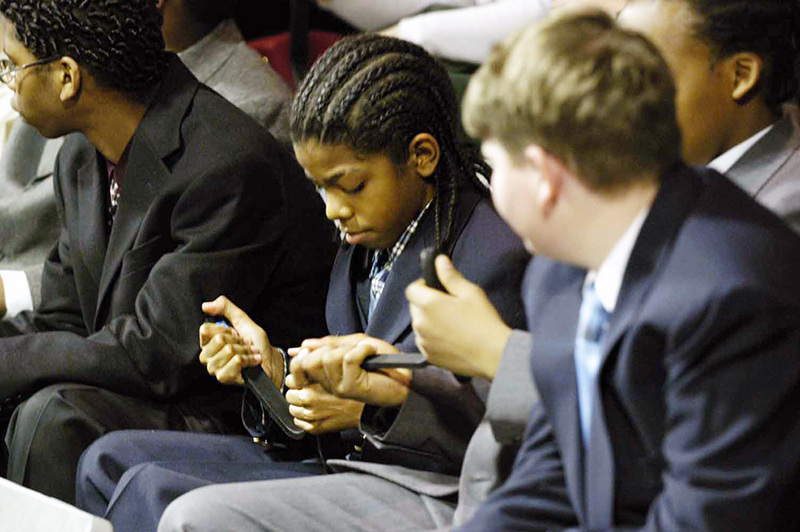 On February 27, 2004, Phillips spoke at the Lemelson Center’s 28th Innovative Lives program. He began the session with a sprint down the hallway to demonstrate his “cheetah leg”--a prosthesis made for runners--to seventh- and eighth-grade arts, science, and life-science classes from four Washington-area schools: the Queen Anne School of Upper Marlboro, Maryland; St. Augustine’s of the District of Colombia; and George St. Rita’s School of Alexandria and Sidney Lanier Middle School of Fairfax, both in Virginia. A few weeks before, Phillips had challenged them to come up with their own designs for artificial legs. His presentation was followed by a think-tank session in which the students discussed and developed their ideas. Phillips described his background and some of the challenges inventors face. He was born in 1954 and grew up in a rural area about thirty miles outside Chicago. He had an older and a younger sister, but most of his friends lived in a suburb about a mile away, so as a child he spent a lot of time playing alone in the woods and fields around his home. He particularly loved to wade in ponds, catching frogs and crayfish. He built multi-tiered tree houses, scavenging nails and boards from construction sites, and made toy boats with outriggers and pontoons powered by rubber-band propellers. In winter, he created huge ice forts by tunneling under the snow that drifted along the patio of his house. His mother let him spray the snow with water from a hose connected to the furnace boiler: it melted a few inches, but then left a hard shell of ice that lasted nearly until spring. He made the spear from a screwdriver found in his father’s toolbox. After spending days filing it to a point, he used kite string to attach the blade to one of his mother’s broom handles. When he took it to a distant field to test it, he was excited to see that it flew beautifully. “It was like the perfect javelin! It landed right in the ground. I ran over there, pulled it out--and on the end of the spear was a big, fat field mouse! It freaked me out.” Phillips put the spear down and never made another one. “I wasn’t in the spirit of it. Spearing the mouse was too much of a message,” he explained. As a boy, Phillips believed that anything was possible--and he still does. The key is to be imaginative and persistent and to find support for your vision. Like many inventors, even as a child he was interested in making things faster, lighter, easier, and better. Although his father sometimes challenged or tried to dissuade him, his parents generally gave him freedom to explore his ideas. Yet, despite his creativity and enthusiasm for making things, Phillips didn’t plan to be a professional inventor. He was more interested in a career in broadcasting, thinking he would work in television advertising. He was in his third year of a broadcasting program at Arizona State University in 1976 when an accident changed his life: a motorboat ran into him as he was water-skiing, and its propeller cut his left leg off below the knee. Surgery after the accident was antiquated and left him in pain for years (he had a second surgery fifteen years later to relieve the pain), but he was back in school a week later, learning to get around on crutches. The first prosthesis he was given was a clumsy one made of wood and foam rubber, and it left him feeling constrained and frustrated. But in the hospital, someone had assured him he’d be able to run again someday, and Phillips, who had always been active and athletic, was determined to make it happen. He continued at Arizona State for another year, and then went to San Francisco for a summer job. While practicing tae kwon do, a form of karate, he began to envision a better kind of prosthesis, one that would have the resilience he needed to be able to jump up and rebound, not just land with the thud of his wooden leg. Phillips knew he needed special training to realize his idea, so he enrolled in one of one of the best programs in the country for prosthetic design, at Northwestern University. 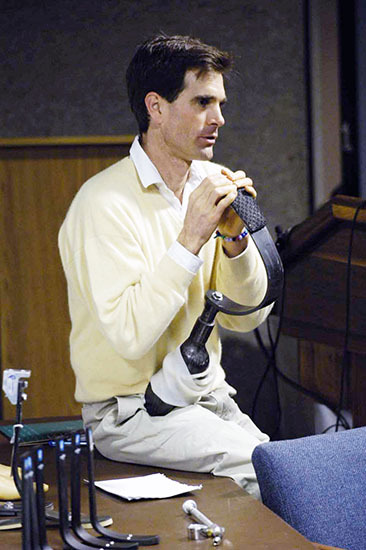 There, Professor John Michaels and Dudley Childress, who was connected with the Northwestern Rehabilitation Center, inspired him and supported his efforts. After graduation in 1981, he went to work at the Center for Biomedical Design at the University of Utah in Salt Lake City. The Center was renowned for its development of the Utah Artificial Arm, invented by Stephen Jacobsen. Phillips’s work there was concerned with sockets, linings, and attachments of prostheses, but on his own time, he explored materials and designs for a leg that would enable him to run and jump again. He had always loved the outdoors, and it was in natural world that he sought ideas. “There’s nothing in the world that hasn’t been thought of before,” he told the students. “Invention is almost always just arranging things in a new way. And the way you get the idea of arranging things is to have the space to do it.” Ideas came to him when he found stillness and quiet in the woods or other natural environment. Being in a receptive state, whether in nature or at home listening to music, is an important part of the inventive process, Phillips explained. In that state, ideas emerge and can be developed in one’s mind. Once he had the concept, he searched for materials that would meet his requirements of energy return, durability, strength, and lightness.. 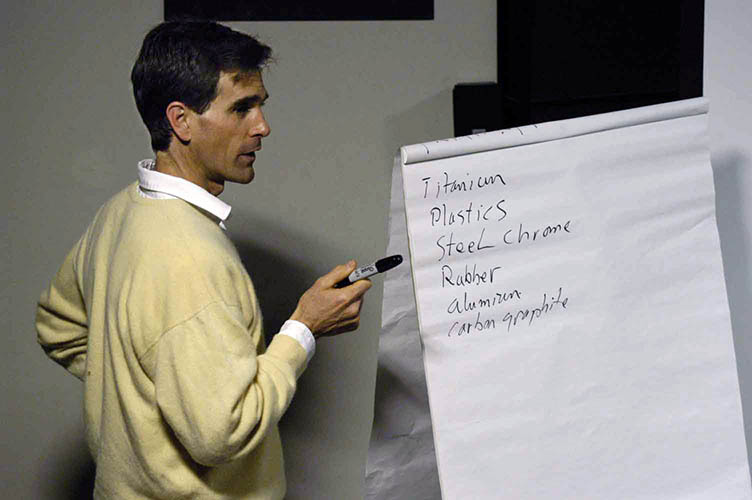 He compared the characteristics of many materials, including fiberglass, rubber, plastic, and carbon graphite. In every respect, carbon graphite, a carbon-fiber composite used in the aerospace industry, proved superior. The experience was often risky. Phillips did all the testing, nearly injuring himself several times when a bolt broke or leg suddenly fell off or collapsed. He became severely ill one time when he broke a vat of toxic chemicals and inhaled the fumes as he attempted to clean up the spill; he was in bed for a week, barely able to eat or move. Taking risks is often a part of the inventive process, he explained, since inventors try things that have not been done before. Phillips, who now holds 60 patents worldwide, sold Flex-Foot to an Icelandic company, Össur, in 2000. He was ready for other things. Although not a competitive runner, he has trained with a university track team and taught running to young amputees. In 1999, he established a nonprofit foundation, Second Wind, to help amputees who do not have the means to help themselves. Through the foundation, he has supported Project Concern, which operates a facility in Nicaragua for land-mine victims. Phillips is now working independently to design an artificial leg for land-mine victims in developing countries, a prosthesis that will function nearly as well as a Flex-Foot, cost no more than $10, and be easily repaired. Phillips’s goal with Flex-Foot was to design a leg good enough to run on, a foot so natural in feeling that he would be able to forget he was wearing it. The model he wears “has almost every single component that a real foot has. Some days when it’s really good, I forget.” Today he lives in Mendocino, California. One of his projects there is to renovate an old building he has bought to create a coffee house and gathering place for the community. It would also be a place for improvisational theater. He is again pursuing his interest in performance, taking acting classes in San Francisco and aiming to work in independent films. When he has free time, he enjoys hiking, and he still finds that new ideas come to him whenever he is close to nature.